All Qualified Candidates from All India NEET PG 2017 up to rank 30,052 who have applied to Sikkim Manipal Institute of Medical Sciences are called for counselling on 5th April 2017 under General Category . All Qualified Candidates from All India NEET PG 2017 who have applied to Sikkim Manipal Institute of Medical Sciences are called for counselling on 5th April 2017 under NRI Category . In the likely event of these seats being recognized by MCI, prior to completion of last date of admission, all the candidates in the PG NEET merit list who have applied for admission in SMIMS will be offered seats according to PG NEET Merit list 2017. There will be active verification of the NEET All Indian Overall rank submitted by the candidate with the information available in the NEET website. Candidate whose NEET All India Overall rank does not match with the information with the NEET website will be disqualified for the counselling process. Candidates will be called as per their NEET All India Overall Rank 2017 for document verification. Successful candidates will be allotted seats according to their rank and number of seats available. Such candidates should submit their original documents and pay the first year fees at the counselling. Sikkim Manipal Institute of Medical Sciences will not entertain any requests for extension in this regard. Candidates are required to join the course by 22nd April 2017. 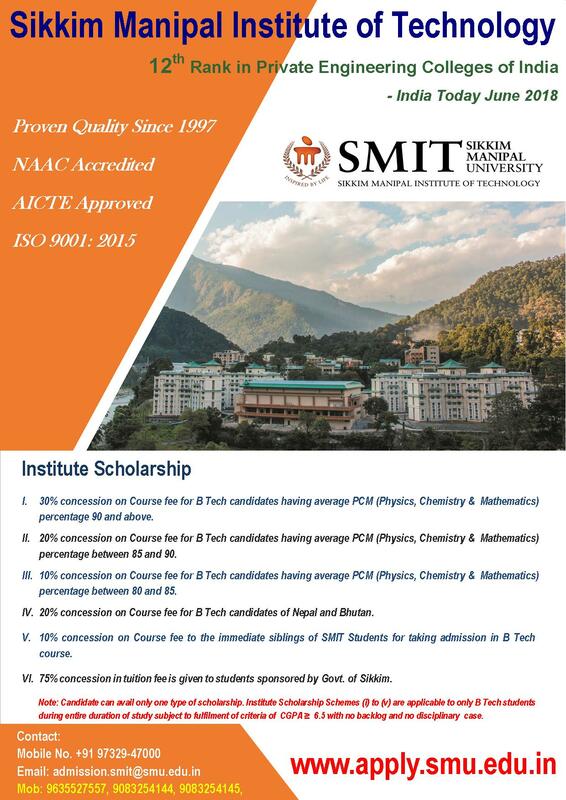 General Category: The first year course fees and registration fees should be paid by demand draft drawn in favour of ‘Sikkim Manipal University’ payable at Gangtok. (The payment to be made only through Demand Draft. Request for payment course fee by Cash, RTGS,NEFT, Multicity cheques will not be entertained under any circumstances). 3. Demand Draft of USD 500 or equivalent INR 33,000 /- as registration fee. (non-refundable) at the time of admission. 4. Both Registration & Hostel fee can be combined in one single draft in favour of Sikkim Manipal University, payable at Gangtok. 5. The 1st Instalment tuition fee of USD 70,500 has to be made within 07 days of admission failing which the admission will be cancelled. We have no agents or middleman for admissions. There is no payment seats of any kind.